^ Gabriella. Ozzy Osbourne: the Godfather of Metal. NY Rock. 2002-06 [2016-09-29]. （原始内容存档于2013-10-31） （英语）. ^ Mick Wall. Diary of a Madman – The Official Biography. Zomba Books. 1986 （英语）. ^ 4.0 4.1 4.2 AllMusic No More Tears-awards. [2009-02-22] （英语）. ^ 5.0 5.1 NME Awards 2004 – Full List of Winners]. 新音樂快遞. [2011-12-17] （英语）. ^ 6.0 6.1 UK Music Hall of Fame 2005. BBC. [2011-12-17] （英语）. ^ 7.0 7.1 Black Sabbath Finally Make Rock Hall Of Fame — Whether Ozzy Likes It Or Not. MTV. [2011-12-17] （英语）. ^ 8.0 8.1 Hit Parader’s Top 100 Metal Vocalists of All Time. HearYa. [2016-09-29] （英语）. ^ 9.0 9.1 9.2 Brum 'Walk of Fame' star for Ozzy. BBC News. 2007-07-06 [2010-11-13] （英语）. ^ 10.0 10.1 Ozzy Osbourne Crowned 'Living Legend' At The Marshall Classic Rock Roll of Honor Awards. Ozzy.com. [2010-11-13]. （原始内容存档于2011-04-16） （英语）. ^ 11.0 11.1 Ozzy Osbourne To Receive Billboard's Legend Of Live Award]. 告示牌 (雜誌). 2009-09-17 [2016-09-29] （英语）. ^ 12.0 12.1 12.2 OZZY OSBOURNE Wins 'Literary Achievement' Award at GUYS CHOICE AWARDS – 2010-06-06. [2010-07-10]. （原始内容存档于2013-12-19） （英语）. ^ Past Judges. 美國獨立音樂獎（英语：Independent Music Awards）. [2010-11-13]. （原始内容存档于2011-07-13） （英语）. ^ 14.0 14.1 Weber, Barry. Ozzy Osbourne Biography. AllMusic. 2007 [2008-02-17]. （原始内容存档于2015-07-21） （英语）. ^ Johnson, Ross. What I've Learned: Ozzy Osbourne. 君子雜誌. 2005-01 [2008-02-17]. （原始内容存档于2008-01-22） （英语）. ^ Walker, Jodi. 'God Bless Ozzy Osbourne': New documentary presents the life, art, and addiction of the metal madman. Music-mix.ew.com. 2011-04-25 [2014-04-11] （英语）. ^ Cynthia Ellis: Q&A With Jack Osbourne for God Bless Ozzy Osbourne. 哈芬登郵報. 2011-05-26 [2014-04-11] （英语）. ^ Ruhlmann, William. Black Sabbath – Biography. AllMusic. 2003 [2008-02-17] （英语）. ^ Ankeny, Jason. Biography-Geezer Butler. [2010-07-10] （英语）. ^ Steve Huey Black Sabbath review. AllMusic. [2016-09-30] （英语）. ^ Chart Stats – Black Sabbath. 英國專輯排行榜. [2009-12-19] （英语）. ^ Black Sabbath. Allmusic. [2016-09-30] （英语）. ^ 25.0 25.1 25.2 25.3 25.4 25.5 25.6 Sharpe-Young, Garry. MusicMight.com Black Sabbath Biography. MusicMight. [2016-09-30]. （原始内容存档于2016-03-04） （英语）. ^ RIAA Gold & Platinum database. 美國唱片業協會. [2009-01-28]. （原始内容存档于2012-06-23） （英语）. ^ BPI certified awards. 英國唱片業協會. [2009-02-07] （英语）. ^ Master of Reality Rolling Stone Review. 滾石 (雜誌). [2014-10-13] （英语）. ^ Ruhlmann, William. AMG Biography. Allmusic. [2008-02-14] （英语）. ^ RIAA Gold & Platinum database-"Vol. 4". 美國唱片業協會. [2009-02-12] （英语）. ^ Fletcher, Gordon. Black Sabbath: Sabbath, Bloody Sabbath. 滾石雜誌. 1974-02-14, (第154期) [2008-02-25] （英语）. ^ Rivadavia, Eduardo. Sabbath, Bloody Sabbath Review. [2008-02-25] （英语）. ^ RIAA Gold & Platinum database-Sabbath Bloody Sabbath. 美國唱片業協會. [2009-02-22]. （原始内容存档于2013-08-08） （英语）. ^ Altman, Billy. Sabotage Album Review. 1975-09-25 [2008-02-25]. （原始内容存档于2007-12-31） （英语）. ^ Prato, Greg. Sabotage AMG Album Review. Allmusic. [2008-03-20] （英语）. ^ Prato, Greg. Technical Ecstasy AMG Review. Allmusic. [2008-03-17] （英语）. ^ Pete Sarfas (Taken from the CD reissue of "Orexis of Death plus..."). Necromandus. alexgitlin.com. 2005-07-17 [2016-09-30] （英语）. ^ Cumbrian Bands of the Seventies: Necromandus. Btinternet. （原始内容存档于2016-03-14） （英语）. ^ Daisley, Robert. Bob Daisley's History with the Osbournes. bobdaisley.com. 2010-07-25 [2013-05-19]. （原始内容存档于2013-05-15） （英语）. ^ Unheard Randy Rhoads recordings to be released. Classic Rock Magazine（英语：Classic Rock (magazine)）. 2014-03-20 [2014-03-20]. （原始内容存档于2014-03-26） （英语）. ^ 44.0 44.1 44.2 44.3 44.4 44.5 44.6 44.7 44.8 OZZY OSBOURNE. 英國專輯排行榜. [2016-09-30] （英语）. 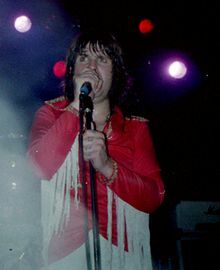 ^ Blizzard of Ozz Billboard Albums. AllMusic. All Media Network. [2015-10-25] （英语）. ^ 46.0 46.1 46.2 46.3 46.4 46.5 46.6 46.7 RIAA Searchable Database-Search: Ozzy Osbourne. [2012-01-22] （英语）. ^ The 100 Greatest Guitarists of All Time. 滾石 (雜誌). 2003-08-27 [2008-02-17]. （原始内容存档于2008-02-16） （英语）. ^ NTSB Accident Report for Rhoads' plane crash. Planecrashinfo.com. [2014-10-13] （英语）. ^ Osbourne, Sharon. Sharon Osbourne Extreme: My Autobiography. Little Brown. [2013-05-13] （英语）. ^ 87 album search results for bark at the moon. Allmusic. [2016-10-01] （英语）. ^ Billboard album chart history-Ozzy Osbourne. [2009-02-15] （英语）. ^ 1,000+ album search results for the ultimate sin. AllMusic. All Media Network. [2015-10-25] （英语）. ^ Ozzy Osbourne Tribute AllMusic Review by Steve Huey. AllMusic. All Media Network. [2016-10-01] （英语）. ^ 25 album search results for no rest for the wicked. AllMusic. All Media Network. [2016-10-01] （英语）. ^ no-more-tears. AllMusic. All Media Network. [2016-10-01] （英语）. ^ Sharon Osbourne says Ozzfest her biggest achievement. 多倫多太陽報（英语：Toronto Sun）. [2016-10-01] （英语）. ^ Weber, Barry; Prato, Greg. Ozzy Osbourne Biography. Allmusic. 2014-10-13 [2007-08-20] （英语）. ^ Battle for Ozzfest Show Cast, Episode Guides, Trailers, Aftershow & Previews. MTV. [2007-08-20] （英语）. ^ Ozz Fest 2010 Part II. Live review. Metal army. 2010-09-17 [2016-10-01]. （原始内容存档于2015-04-02） （英语）. ^ History. Ozzfest. 2011 [2011-07-18] （英语）. ^ MTV Onair - Osbournes. MTV. [2010-02-08] （英语）. ^ The Osbournes (2002–2005)Episode List. 網路電影資料庫. [2016-10-01] （英语）. ^ Palace party draws 15m viewers. BBC. [2012-05-15] （英语）. ^ Osbournes to Host American Music Awards. 時人 (雜誌). [2008-06-25] （英语）. ^ AllMusic Review by Bradley Torreano. AllMusic. All Media Network. [2016-10-01] （英语）. ^ 70.0 70.1 Ozzy Osbourne Official Website - Biography. Ozzy.com. [2014-04-02]. （原始内容存档于2014-04-07） （英语）. ^ Billboard album chart history-Ozzy Osbourne. 告示牌 (雜誌). [2009-02-17] （英语）. ^ I Can't Believe It's Not... OZZY? Legendary BLACK SABBATH Frontman To Promote UK “Butter” Facsimile. Bravewords. 2006-02-03 [2016-10-02] （英语）. ^ AllMusic Review by Stephen Thomas Erlewine. AllMusic. All Media Network. [2016-10-01] （英语）. ^ Show intro with hosts The Osbournes. UK: Brits. 2008 [2011-12-08]. （原始内容存档于2013-12-13） （英语）. ^ Ozzy to end BlizzCon 2009. 橘郡記事報（英语：Orange County Register） (Terry Horne). 2009-08-11 [2009-08-14] （英语）. ^ Totilo, Stephan. 'Brutal Legend': The Most Absurd Heavy Metal Game Ever?. MTV. 2009-04-03 [2009-04-03] （英语）. ^ Special Guest Hosts. TV Shows, Raw. 世界摔角娛樂. [2010-08-04] （英语）. ^ AllMusic Review by James Christopher Monger. AllMusic. All Media Network. [2016-10-02] （英语）. ^ Two Nights of Ozzy Doc at a Multiplex Near You. Music Film Web. [2011-08-08] （英语）. ^ Ozzy Talks OZZFest, 'Scream' Tour, Biopic. 告示牌 (雜誌). 2009-09-14 [2010-08-04] （英语）. ^ Trust Me, I'm Dr. Ozzy: Advice from Rock's Ultimate Survivor by Ozzy Osbourne. NOOK Book (eBook). [2016-10-02] （英语）. ^ Black Sabbath announce new album, world tour. Reuters. [2011-11-14]. （原始内容存档于2011-11-22） （英语）. ^ Reunited Black Sabbath play Birmingham gig. BBC News. 2012-05-21 [2013-02-09] （英语）. ^ Black Sabbath. 英國官方排行榜公司. [2016-10-02] （英语）. ^ Thomas, Fred. Ozzy Osbourne - Memoirs of a Madman review. AllMusic. All Media Network. [2015-12-25] （英语）. ^ Black Sabbath Announce THE END Tour. Black Sabbath. 2015-09-03 [2015-09-13] （英语）. ^ Ozzy and Jack's World Detour Full Episodes, Video & More. 歷史頻道. [2016-08-21] （英语）. ^ Black Sabbath bow out in Birmingham with final concert. 英國廣播公司新聞網. 2017-02-05 [2017-02-05] （英语）. ^ （影音）「黑色安息日」返鄉告別唱 重金屬教父團傳奇不落. 自由時報. 2017-02-05 [2017-02-05] （中文）. ^ OSBOURNES Land At No. 12 On FORBES List of Most Powerful Celebrities. Blabbermouth.net. 2003-06-20 [2016-10-02] （英语）. ^ Ozzy Osbourne. 洛杉磯時報. [2016-10-02] （英语）. ^ Nick de Grunwald. Classic Albums: Black Sabbath - Paranoid (紀錄片). 英國廣播公司第二台: Eagle Rock Entertainment（英语：Eagle Rock Entertainment）. 2010-06-28. ASIN B000WEWIBS （英语）. ^ Fifth grandchild for Ozzy Osbourne. 時人 (雜誌). 2012-01-23 [2013-06-30] （英语）. ^ Ravo, Nick. At Tea With – Ozzy Osbourne – Family Man. Fights Fat, Is Good With Kids. 紐約時報. 1992-09-23 [2010-02-15] （英语）. ^ Kennedy, Helen; Burger, Timothy J. W rocked by Ozzy at dinner. 紐約時報. 2002-05-05 [2008-12-07]. （原始内容存档于2009-10-03） （英语）. ^ Sunday Times rich list 2016 for musicians. 每日快報. 2016-04-21 [2016-10-02] （英语）. ^ Ozzy Osbourne - Under Cover - Reviews. 金屬百科（英语：Encyclopaedia Metallum）. [2016-10-02] （英语）. ^ Ozzy Osbourne Suffers Injuries in House Fire. Loudwire（英语：Loudwire）. 2013-01-17 [2016-10-02] （英语）. ^ The Prince of Darkness is a pensioner!. 每日快報. 2013-12-04 [2016-10-02] （英语）. ^ The rest of the story. Dial-the-Truth Ministries（英语：Dial-the-Truth Ministries）. [2011-03-30] （英语）. ^ OZZY OSBOURNE Talks 'Scream', Getting Sober And Why Lady Gaga Is So Great. Blabbermouth.net. 2013-11-27 [2014-07-28]. （原始内容存档于2010-07-26） （英语）. ^ Ozzy Osbourne's Genetic Code Being Mapped. CBS News. 2010-06-15 [2014-07-28] （英语）. ^ Ozzy Osbourne Biography. Sing365.com. [2011-03-30]. （原始内容存档于2011-09-04） （英语）. 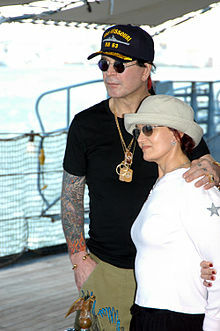 ^ Ozzy Osbourne: Sharon Saved my Life. OK! Magazine. [2014-07-28] （英语）. ^ Rodell, Chris. Notorious story of Ozzy at The Alamo is mostly all wet. 波士頓先驅報（英语：Boston Herald）. 2005-05-17 [2009-03-28]. （原始内容存档于2009-01-05） （英语）. ^ Highs and lows of superstar Ozzy. Entertainment News (BBC). 2004-11-23 [2009-03-28] （英语）. ^ Ozzy Osbourne. 新音樂快遞. UK. [2008-11-19] （英语）. ^ Ozzy Osbourne – Osbourne Diagnosed with Parkin Syndrome. contactmusic.com. 2005-11-30 [2009-03-28] （英语）. ^ Scientists Probe Ozzy's Body for Medical Miracles. 滾石 (雜誌). 2010-06-15 [2016-10-02] （英语）. ^ Disrupting Genomics with Jarret Glasscock. EQ - Entrepreneur Quarterly STL. 2015-10-19 [2016-10-02] （英语）. ^ Moreman, Christopher M. Devil Music and the Great Beast: Ozzy Osbourne, Aleister Crowley, and the Christian Right. Journal of Religion and Popular Culture (Department of Religious Studies and Anthropology, The University of Saskatchewan). 2003-10-05, V [2008-06-09]. （原始内容存档于2012-10-30） （英语）. ^ Ravo, Nick. AT TEA WITH: Ozzy Osbourne; Family Man. Fights Fat, Is Good With Kids.. 紐約時報. 1992-09-23 （英语）. ^ 117.0 117.1 Munson, Kyle. Ozzy left his mark. 得梅因紀事報. [2009-03-28]. （原始内容存档于2009-10-08） （英语）. ^ Terr. Top 10 crazy music myths. Upvenue.com. [2013-06-30] （英语）. ^ Ozzy Bites Head Off Bat! Rock's Wildest Myths #2. 滾石 (雜誌). Upvenue.com. 2004-10-12 [2009-03-28] （英语）. ^ Listed at FindLaw.com: 202 Cal.App.3d 989 No. B025565. McCollum v. CBS, Inc. 1998-07-12 [2013-06-30] （英语）. ^ Nuzum, Eric. 《Parental Advisory: Music Censorship in America》. New York City: HarperCollins. 2001: 第57–58頁. ISBN 0-688-16772-1 （英语）. ^ Ozzy Osbourne Lawsuit Dismissed, But 'Not Over Yet'. Yahoo! Music（英语：Yahoo! Music）. [2008-08-04] （英语）. ^ Federal Appeals Court: Ozzy Does Not Owe Royalties. KNAC（英语：KNAC）. [2014-10-13]. （原始内容存档于2014-07-24） （英语）. ^ Music stars record tsunami single. BBC News. 2005-01-20 [2016-10-05] （英语）. ^ Music Stars Contribute To Disaster Relief Single "Tears In Heaven". 蓋帝圖像. [2011-10-05] （英语）. ^ The 25th Anniversary Rock & Roll Hall of Fame Concerts (4CD). Amazon.com. [2011-11-25] （英语）.